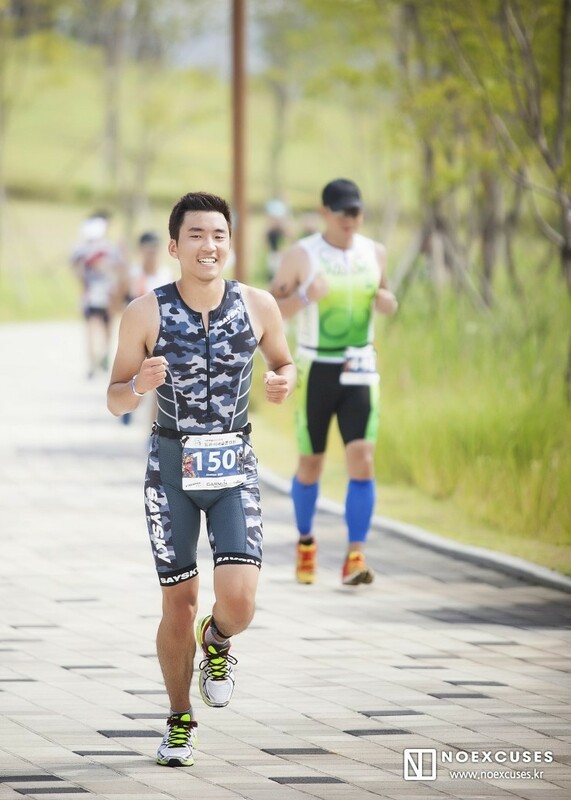 Well, after the Suwon Triathlon, I never thought I would write this sentence, but yeah, I finished my second triathlon race. 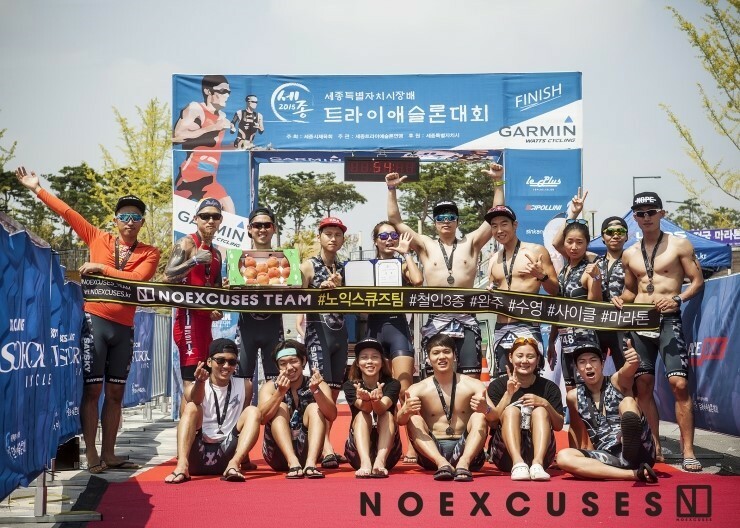 I completed the race not alone, but together with my team NOEXCUSES. I joined the team a month before the race, and trained together every week. This time, I did not finish the race with mixed feelings, but with full of positivity. 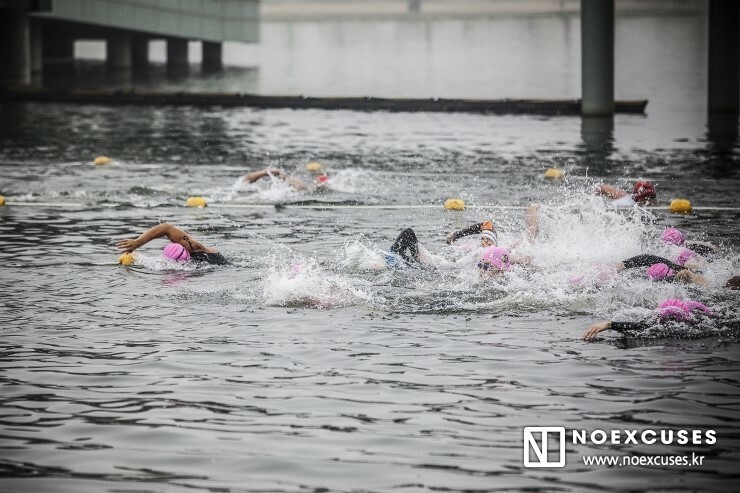 The race was held at Sejong, which is the new government and administration acting capital city for South Korea. We arrived in Sejong the day before to register our names and get our bikes checked out. We also got to try out swimming in the lake. The water was not clean, but it was better than Suwon’s. It got dark out, so we all drove to a camp where we’ll be having dinner and spending the night. The road was pitch black and unpaved. We were kind of expecting a sketchy haunted house, but wow, surprisingly, the camp was amazing: nice facilities, clean air, friendly cats (lol), and cozy rooms. We had a really, really nice dinner, prepared and cooked mostly by Suyun (thank you! ), and a fun time as well. Physical therapy sessions by Jinho followed and finally we had a good night sleep. We got up early in the morning and drove to Sejong Lake Park. We put on our wet suits and waited for the starting time to come. I was strangely not nervous. I sure wasn’t pumped up, but rather calm. The horn blew and we all dived in like a bunch of fish left on land. It was chaotic just like the prior experience, but I think I kept my pace okay. 1.5km did feel like forever, but it wasn’t too bad. One step at a time and I would be finished soon or later. I got out of the water and ran to the transition area. Thankfully the transition area was pretty close. I tried not to strip down like crazy, but took plenty of time to get myself ready for 40kms of cycling. I hesitated to put sunscreens on, but I just went forward (To think of it now I regret it so much!). I breezed through the 5 laps of 8km. I wished I had more water, but I felt good overall. Weekly training with NOEXCUSES payed off. I managed to cut down 16 minutes from the first race just in cycling. I loved how the racers cheered on each other throughout the race. Finally, my nemesis, running. 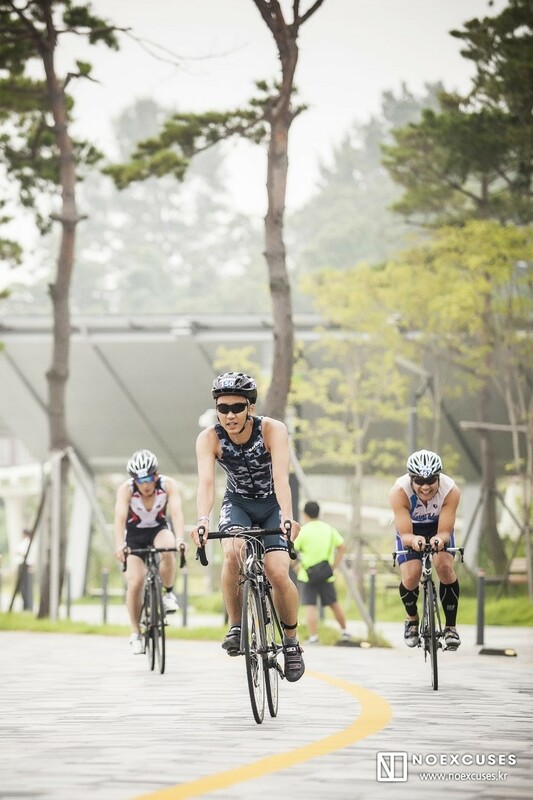 In my first race, my mind almost exploded from the thought of giving up. But this time it was different. I was exhausted and all, but I kept on thinking, ‘Well, I’ll be finished soon. Just a few more minutes, a few more steps. Then I’ll be done.’ I found myself weighing my thoughts more to completing the race rather than giving up. I maintained that thought throughout the race. And finally, I finished the race! 2 hrs 37 mins 13 secs. 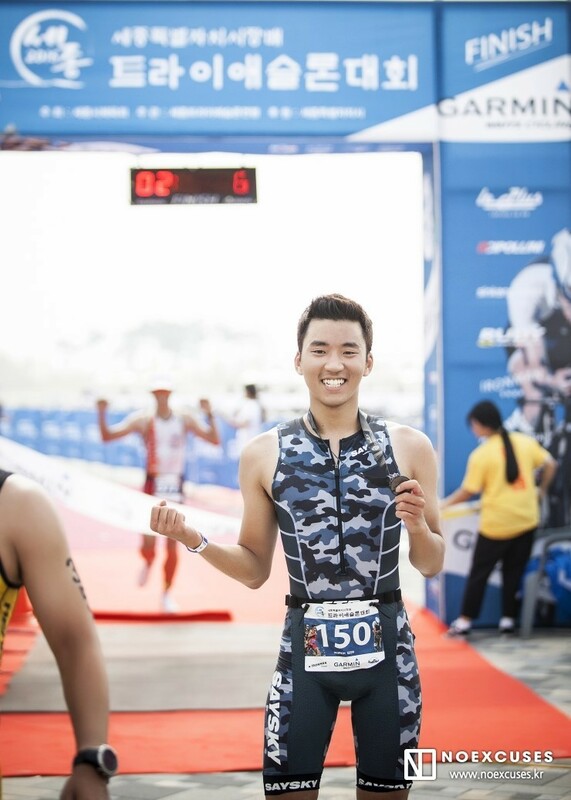 That was 32 minutes faster than the Suwon Triathlon’s. I feel safe to say that the improvement resulted because I had a team that competed with me. It kind of sounds like a cheesy Disney sports movie, but that was it. The team helped me improve my cycling skills and have a positive mind. I could picture myself doing a third triathlon race and even more lengthy courses. It was an awesome experience. Enhanced skills and positive mind definitely alleviates the weight of challenges that hinder your goal. And those two qualities come from each other, not from yourself alone. This race has taught me a valuable life lesson.